Several years ago, my husband and I decided to ditch our traditional lawn and the water-thirsty plants that surrounded our house. Southern California has a dry, Mediterranean climate, and it didn’t make sense to maintain landscaping that really didn’t belong. At the time, we were just at the beginning of our multiple-year drought but we could read the writing on the wall: watering restrictions were coming. So, out went the turf, agapanthus, and day lilies, and in went the succulents and other plants more suited for our climate. No more regular mowing and fertilizing; no more brown spots dotting our green lawn as a result of neighborhood dogs doing what dogs do. 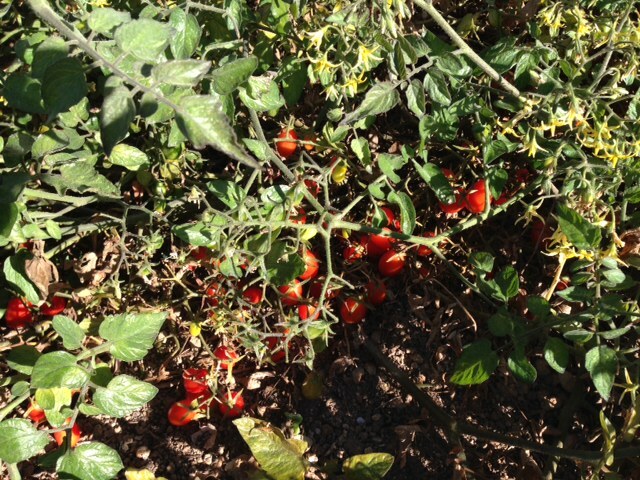 What we now have in our yard is a rich tapestry of colors, shapes, and textures. The bright reds, pinks, and oranges of the appropriately named ‘Sticks on Fire’ (Euphorbia tirucalli) contrast with the deep burgundy of the ‘Zwartkop’ (Aeonium arboreum) and the silver-blue Senecio mandraliscae. 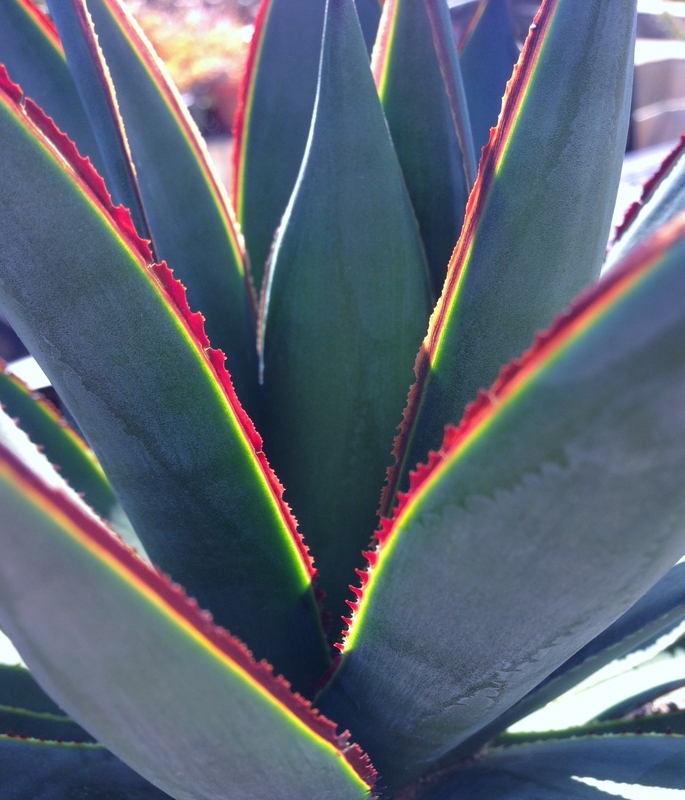 The fat, jelly bean shape of the sediums play nicely with spiked-leaved Agaves and Aloes. And, just when I think my succulents are quietly behaving themselves, one will suddenly produce a flower so garish and spectacular it can take my breath away. 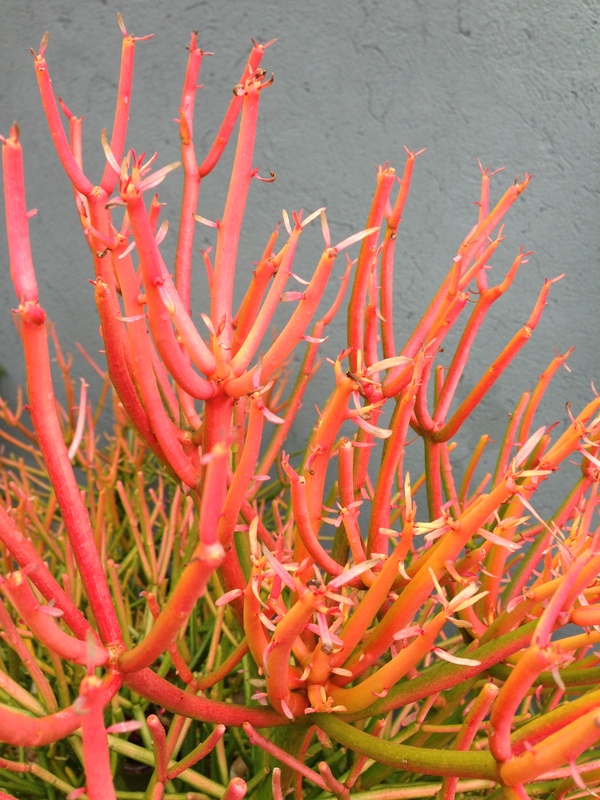 Because succulents don’t require regular watering and they are amazingly easy to care for, they are the perfect plants for our lifestyle in retirement. I can putter in the garden… or not, and we can travel for weeks at a time and not have to worry about arranging for their care. 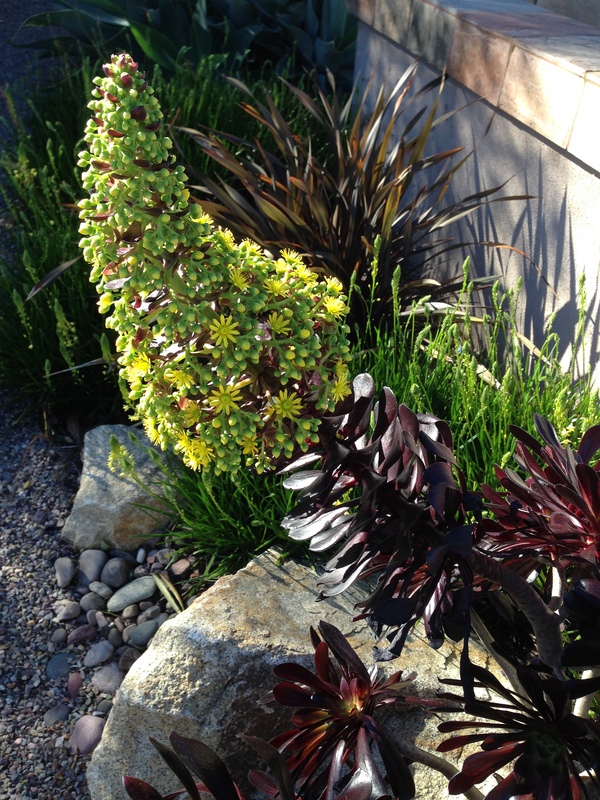 As I walk around our neighborhood and see front yards landscaped with the standard plantings and boring grass (often which has turned brown due to our drought), I am so grateful when I return to the lush growth and dazzling pallet of my succulents. 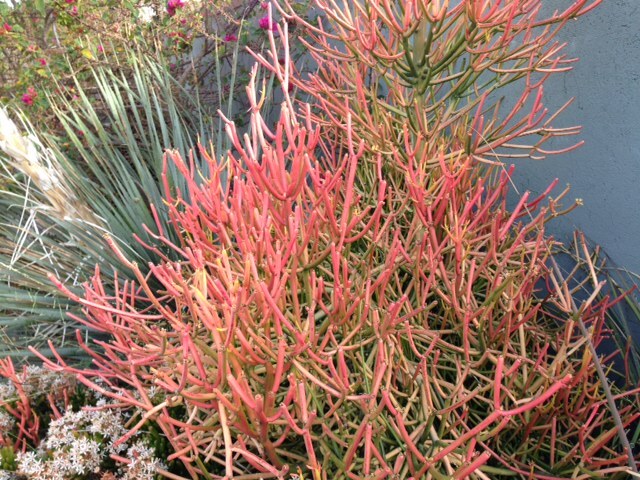 Succulents are sculptural, low-water plants that come in an almost unending variety of shapes, sizes and colors. These dry-climate jewels are perfectly suited to our area’s Mediterranean climate because they store water in their leaves, stems, or roots. 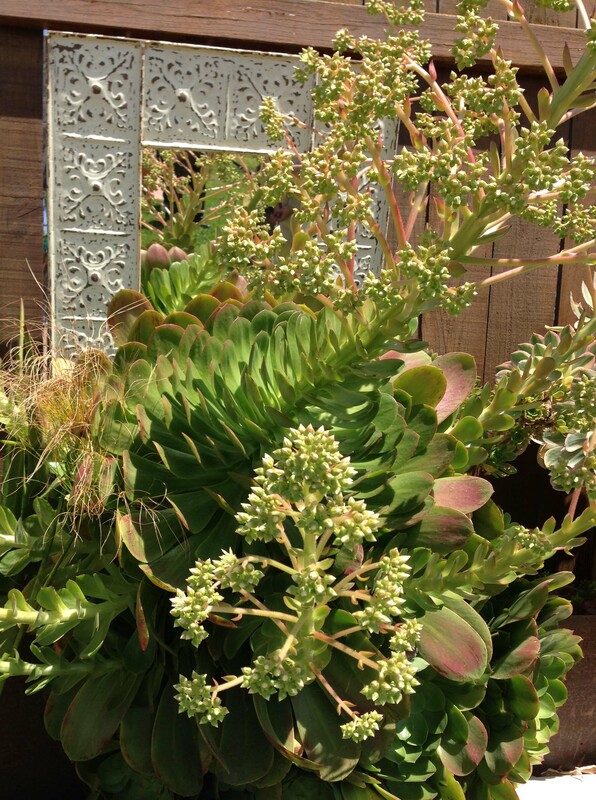 The mirror hung on the fence bounces the sunlight and reflects another view of the aeonium in bloom. Even those who deny climate change (or, at least the impact we humans have had) must have a hard time ignoring the wild swings of weather conditions the United States—and the world—has experienced over the last several years. Those of us on the West Coast are in a severe, multi-year drought while those in other areas of the country have endured record cold temperatures. Now, I’m reading news stories about torrential rain and flooding on the East Coast. Here in San Diego, fire crews are just finishing battling nearly a dozen individual wild fires that burned around 26,000 acres and required over 125,000 people to evacuate. Although California has had wild fires throughout the state’s history, this mix of low humidity, triple-digit temperatures, and hot, dry Santa Ana winds in May is most unusual… and troubling. No one is naive enough to think that we’ve seen the worst of it. This is just the earliest start of our fire season in decades. What we used to brace ourselves for in September and October could now be a threat year-round. 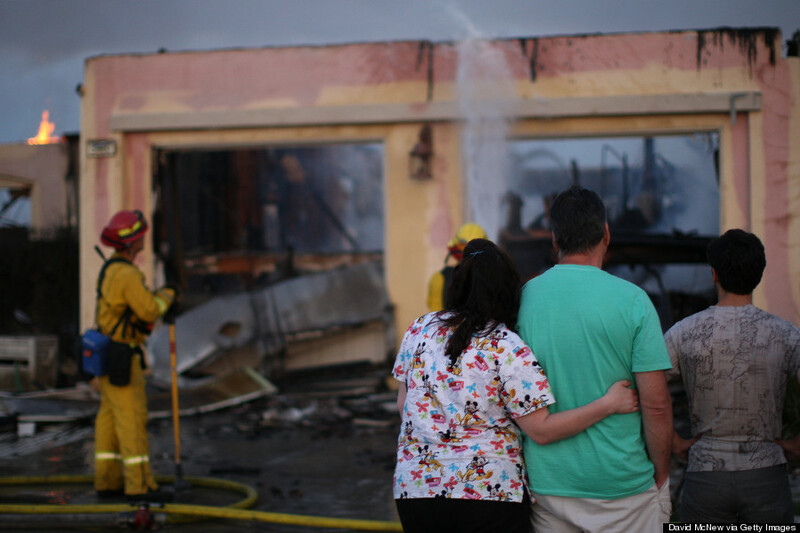 Our home was well away from the fires, but, along with so many others, we watched the scenes of the firestorms on the TV; cheering the heroics of the fire fighters as they battled the blazes in their attempt to save homes and lives. Because of their efforts, “only” around 70 homes were destroyed and no lives were lost (contrast that to 2003, when 2,232 homes were destroyed and 15 people died, and 2007 when 1,500 homes were lost and 9 died). Now that most of the fires are fully contained the focus has switched from fighting the fires to mopping up and surveying the damage. It is heartbreaking to see the bewildered faces of people standing in front of what once were their homes. It is the same look seen after the devastating hurricanes, super storms, tornados, earthquakes, and so many other recent disasters we’ve witnessed. 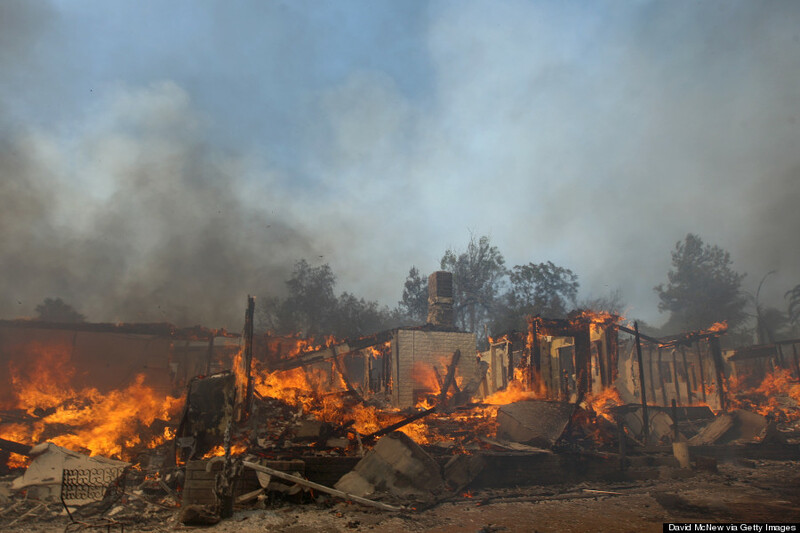 As I look at photos of the fires’ destruction, I wonder how the people who have lost their homes will be able to bounce back after such devastation. Most of them say—and it’s true—that it’s only “things” and they are lucky to be alive, but I know how much all of the “things” that are in a home can make us feel safe, connect us to our past, and help us define who we are. A word that I am hearing more and more in the aftermath of these disasters is “resilience” as it relates to systems, nature, and people. Andrew Zolli, the author of Resilience: Why Things Bounce Back described resilient systems as being able to “sense and respond to their own state and to the state of the world around them, compensate or dynamically reorganize themselves in the face of novel shocks, decouple themselves from other fragile systems when necessary, fail gracefully, and have a strong local self-sufficiency.” I think much the same thing could be said of people who are resilient. I don’t believe that we either are or are not resilient. 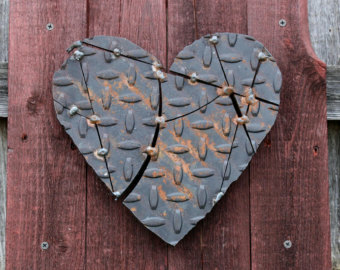 Some who are perceived as fragile by others can exhibit great resilience when faced with a personal challenge or devastating loss. Others, who may appear to be strong and stoic on the outside, might not be able to bounce back as well. Not everyone reacts in the same way to traumatic and stressful life events, but there are steps we can take to become more resilient in the face of adversity. A resilient person will still experience difficulty or distress, but their resilience can influence their ability to recover, persist, or even thrive amid disruption. We all will face increased challenges as we age; the death of loved ones, decreased physical capacity, perhaps a serious illness or even a natural disaster. Building our resilience now will help us better respond and adapt. * This list paraphrases a list from the APA’s brochure The Road to Resilience.